Pixar are known and appreciated for their audaciously high-wire concepts, for pushing the boundaries of the animation industry. Since Toy Story was released way back in 1995, animated film changed for the better; production companies began pushing them into an artsy side and with the ever increasingly helpful aid of computer technology, it's likely that this will just keep growing and animated films will just get bigger and bigger. Which is why it's so surprising that Pixar have subverted this trend. Well, Pixar subvert trends and expectations frequently, but turning against seemingly the entire industry is a risk that could have backfired monumentally. In the actual physical world of Inside Out, the story is very small, and very simple. But leave it to Pixar to go the extra mile not by going outwards, but going smaller yet bigger than any animated film ever has before by taking us inside the mind of a young girl. And it is every bit as wonderful as you'd hope. Inside Out begins with Riley's birth, and we immediately zoom inside her mind, where Joy (Amy Poehler) is born simultaneously, taking control of the headquarters of Riley's mind. As Joy tells us, everything was perfect, but then another emotion is born inside Riley's mind; Sadness (Phyllis Smith). As Riley grows older, more emotions come along, such as Fear (Bill Hader), Disgust (Mindy Kaling) and Anger (Lewis Black), and together the five of them enjoy controlling Riley's emotional stability. However, when Riley's family move home her childhood becomes turbulent, resulting in Joy struggling to keep a positive outlook and failing to encourage the other emotions to help her. After a rough first day at her new school, Joy and Sadness argue in HQ, resulting in Sadness creating a new core memory, Riley's personality islands shutting down, and both Joy and Sadness being sucked away from HQ and stranded in Riley's labyrinthine long term memory. On paper, it's a tough concept to follow. But writer/director Pete Docter (the man behind Monsters Inc and the excellent Up) has such a firm grasp on the ideas in this film that each one sticks seamlessly. The concept of the human mind being controlled by living emotions is an odd one, but one that the film sells entirely, mostly due to Docter's passion and determination for any project he undertakes. Inside Out offers genius ideas such as an understanding of why we get songs stuck in our heads, a literal train of thought that runs through Riley's mind, and a dream section of her brain that is played out as a film studio, projecting the images into Riley's mind. Every time you think Inside Out has played its smartest, most smile-inducing innovation possible, it comes back and tops it five minutes later. The film plays out as an endless string of smart, original ideas and concepts that refuses to stop giving. But it also succeeds in being so much more than just a good idea. Inside Out holds great claim to being Pixar's most emotional film over their twenty year production span. By starting this film at Riley's birth and intricately narrating us through the initial stages of her life, we understand her perhaps a great deal more than we realise. This is also benefited by the fact that, when bad or upsetting things happen to Riley, we know why they have happened; we see it take place both inside and outside of her mind. It all comes together to form a final act of deep emotional complexity, and while from a distance it might not seem like much is at stake, the actions of Riley's emotions will dictate how she lives her life. If you ask me, no animated film of any scale has any larger threat than the emotional stability of a young girl with her entire life ahead of her. And Docter, whose own children inspired the concept for this film, understands this fully, creating a powerfully moving resolution to his story that succeeds in acting as both a satisfying narrative conclusion and an impressive piece of character work. It's the kind of intricate plotting that Pixar hasn't presented us since Up, and it's a huge welcome return to form. Inside Out is, after all, a kids film. Despite its reliance on intelligent ideas and a story that perhaps might not be understood fully by children until they re-watch it when they're older, Docter's film does have to conform to its target audience, but it does so wonderfully. 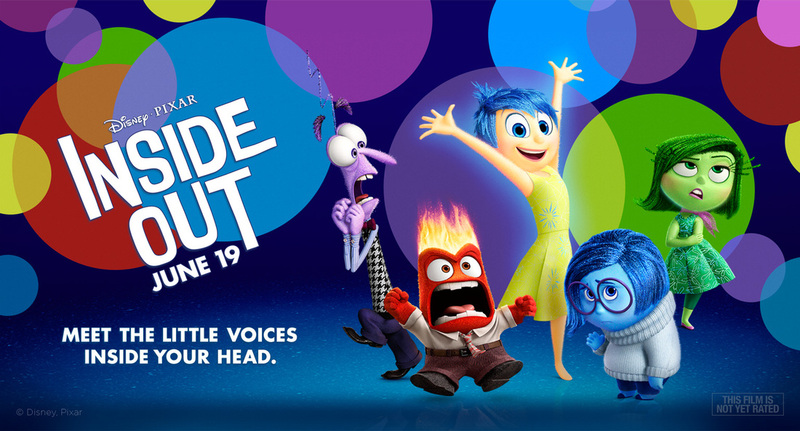 Inside Out is stunningly realised visually, and beautifully animated to match. The labyrinthine layout of Riley's long term memory is not only a clever visual play on the appearance of the human brain, but an eye-popping display of colour and thoughtful imagination. In perhaps the film's most bizarrely ambitious sequence, Joy and Sadness get stuck inside Riley's abstract thought, changing their visual appearance constantly to become weirder and weirder. In terms of visual design, Inside Out will entertain the kids from the offset, but it's also paired with some fantastic humour. When the film isn't being emotional, it's brilliantly funny, and when it isn't being funny, it's brilliantly emotional. Occasionally it manages to pull off both at once. Only the best films achieve that. It's very difficult to criticise Inside Out realistically. There are, of course, logical issues with the film's concept. For example, both of Riley's parents are controlled by the same five emotions as Riley herself, despite their obviously different personalities and life experiences. But this doesn't matter, should Inside Out have taken on a vaster range of emotions for Riley's mind, the film's narrative would become muddled, and the emotional weight would get lost along the way. The film is not attempting to achieve realism inside Riley's mind, it is attempting to achieve it on the outside. And when looked at from this perspective, Inside Out never puts a foot wrong. It takes a small, seemingly unimportant story and plasters it with intelligence, depth, emotion and humour, whilst also acting as a strong metaphorical insight as to how the human mind works. It is a truly stunning film that, even when compared to the countless number of modern classics they have released over the last two decades, makes solid claim to be the greatest 94 minutes of cinema Pixar have ever produced. To Summarise: With smart humour, breathtaking visual design, emotional character work and a plethora of innovative ideas and themes, the beautiful Inside Out sits firmly at the top of Pixar's ever-growing list of modern animated masterpieces.